I always crave banana bread -- moist, tender, nut studded slabs with plenty of butter on top. I don't always crave the calories that come with it. That's why I have been experimenting with a creating a healthier, reduced fat banana bread that will keep both tummy and my hips happy. I have succeeded. This banana bread is low in fat and calories yet high in fiber, protein, and heart-healthy omega-3 fatty acids. Instead of fats such as butter or oil, I used healthier egg whites, low-fat buttermilk, non-fat yogurt, and orange juice. Instead of just plain white flour, I used protein and fiber-rich oats and whole wheat flour and omega-3-rich flax seed and walnuts. The cherries are a seasonal surprise that add sweet juiciness to eat bite. Of course, you could substitute other fresh fruit such as apples or mangoes or dried fruit such as raisins or apricots. Oh, and don't worry. It tastes great. 1. Position a rack in the center of the oven and preheat to 350 degrees F. Coat 2 (8 1/2 X 4 1/2 -inch) loaf pans with cooking spray. 2. To toast the oatmeal, place in a dry skillet over medium-low heat, stirring occasionally, until golden, about 3-4 minutes. Set aside. 3. In a medium size bowl, whisk the toasted oats, flours, baking soda, salt, cinnamon, and nutmeg. 4. In a large bowl, beat brown sugar and eggs. Add buttermilk, yogurt, orange juice, and vanilla; beat until batter is smooth. Lower the speed; add the orange zest and bananas, and beat briefly (it's ok if the batter has a few lumps). 5. Add the flour mixture to the egg mixture, and mix until just incorporated. Using a rubber spatula, fold in the cherries, walnuts, and flax seed. The batter will be thick. Pour the batter into the pans. Bake for 35-45 minutes, or until the top is a deep golden brown and a cake tester inserted into the middle comes out clean. 6. Transfer the breads to a rack; let cool for 10 minutes, then unmold and place on a rack to cool to room temperature. Don't forget to enter for your chance to win 2 free tickets to see Julie & Julia in LA on Thursday, August 6th! yum! I'll have to make this vegan. This looks so delicious! The texture of the bread in the first photo looks so good. 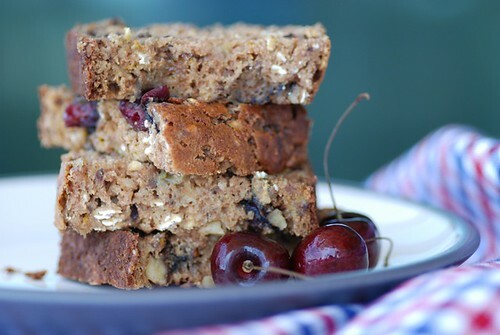 I love the addition of cherries to the bread! Looks delicious! Love banana bread too...thanks for whipping up a healthier version! This looks so yummy! Healthy and delicious! A delightfiul bread! 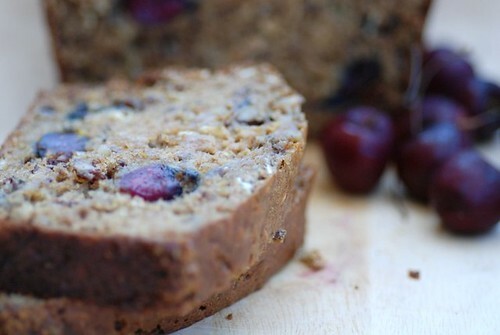 i love banana bread too and have been using all kinds of fruit to pair it with but not cherry - yet. will have to do this soon! brilliant recipe! I crave banana bread too. This looks wonderful! My kind of post....just the title alone in my Reader was enough for me to jump over to your blog and hit 'Print'. For all your effort, we get the delicious result. I may need to make this right away!! Loving all the cherries around! I can just imagine the perfectly juicy bites of cherries in the banana bread. real good idea. This is my kind of breakfast Susan. Those cherries really make your already great bread simply spectacular! This is a cake I will make, for sure! Looks delicious. I love that it's healthy. Ohhhhh banana breads usually look dull, even though they taste great, but yours looks yummy and beautiful and it is so colorful, love it! Looks so good; those cherries are calling to me. Also took your advice and bought powdered buttermilk! Can it be used in any baked good? Health food does not normally look that good. I could do with a slice of that! Yummy Yummy! I am going to keep this recipe for later in the year when we go cherry picking! mmm, hearty deliciousness! I love the pictures! Oh man, this looks delicious! Even with the word "healthy" in the title, you've still drawn me in with the deliciousness! :-) Kidding. Looks delicious! I just made some healthy banana muffins this week, but now I'm sad mine didn't have cherries! elissa-Thanks. I was happy that it came out moist. meeta-Then you've gotta try it! It's wonderful! diva-I always have a few ripe ones ready to bake too! lydia-Those would be good too. kate-That's so kind of you! Thanks a bunch! soma-They do lend sweetness and moistness. sha-I'm glad to hear it! kara-Those will work. But be sure to get yourself a cherry pitter soon! cris-That's awfully sweet of you to say. abby-I use it in lots of baked goods. mark-They are expensive little buggers, but worth it. rose-Yay! I'm so happy you like it. I subbed whole wheat pastry flour for white and I used spelt for whole wheat; I used a little extra banana and omitted the yogurt and orange juice since I had extra bananas and no orange juice; blueberries instead of cherries; an extra 1/2 cup walnuts; 4 whole eggs instead of part whole and part whites; lemon zest instead of orange, I added a teaspoon of lemon extract. Before I baked it I sprinkled some coarse sugar over the top (about a tbsp per loaf). Awesome! Thanks so much for the inspiration! wow,yummy!i love banana and it looks so delicious.. i want to try this at home.. thanks,keep on posting..
Ohhhhh mann. this sounds like the perfect way to start the morning! I made the bread. At first it was very dry and hence seemed very healthy. But later with the water of the cherries, the bread moistened. Everyone loved it! But I think some oil would have made me happier that this seemed too healthy! I found your blog & this recipe in a Google search, and then realized I already know your work from NPR, and probably Cooking Light as well! The bread is great - I just made it, and ate two slices warm from the oven. I had to bake it for about an hour, though, and I subbed coconut for the walnuts because A) I had coconut and 2) DH doesn't like walnuts (and I shouldn't eat 2 loaves by myself). It does have a lot of ingredients, but I knew it was meant to be when I realized I actually had buttermilk, an orange, and a couple of lonely brown bananas lying around, not to mention I used up the last of the overzealous 3 lbs of cherries I bought last week. It is very moist & not too sweet (a little salty, tho? easily fixed). It's also very photogenic (just like your pic! ), smells great, and easy to eat with one hand while dashing out the door - I believe it is likely to become a new breakfast staple. Thanks! Just made it, very moist and not to sweet. Next time I would leave out the orange zest. To sharp a taste for me. And PS to all the comments, it would be more helpful to everyone if you leave a comment AFTER you try the recipe. Not just saying you will try it. IE: I read a few to hopefully get a feel for IF I wanted to make it and I couldn't find a coment where someone actually made it.